If someone microchips their dog we think of them as acting loving and responsible. We also put dogs to sleep, right? So maybe that’s not the best analogy. As you can see, microchipping a human is controversial. Some would argue it’s an invasion of privacy. Others would argue it could be used by someone other than a family member or police. Others say there are health concerns, such as cancer. We insert pacemakers, steel rods and plates, silicone and collagen into our bodies, surely we can figure out how to make a tiny chip safe (enough) to give us some peace of mind. You might feel different if you’ve ever lost your mom or dad. If they’ve ever snuck out of the house half dressed or not dressed at all. If they have Alzheimer’s and are not thinking clearly–insist they’re going to catch a taxi–my mother said that constantly even though I’m not sure she had ever ridden in a taxi in her life–and how in the world did she happen to remember that word but not her own daughter’s name? Many, many, many night, I caught my mother trying to escape. We had several safety measure on the doors, and an alarm system that would beep if any doors or windows were opened, but still, I worried. She insisted she had to go preach, had to go to church, needed to go to the store and mostly….she needed to go home. I was also worried because there was a river in our back yard and a 17 foot bluff/drop off. That didn’t seem to register to mother who was drawn more to the driveway and the street. We caught her in the bushes–a lot. And I was a vigilant caregiver. She was just slippery. I actually thanked God she had Parkinson’sto slow her down. Terrible thing to be thankful for, but as I see other moms with Alzheimer’s, and knowing my mother’s strength and fiestiness, I was grateful for any deterrent. So they won’t get out and get hit by a car. So they wont’ be kidnapped, raped, fall, wander in the woods. So that so much time doesn’t lapse that they miss crucial medications. So that if they take a car, bus, or train, you’ll know and won’t spend precious minutes, hours, or days in absolute panic and terror. So yes, I would microchip. Give the benefits of the chip outweighs the risks. I think. Let’s not confuse the issue here: most microchips simply hold information so that if/when the person is found, the information can be “read.” Most of these chips are not tracking devices. Technically, they’re called RFID–Radio Frequency Identification Device. One of the major controversies has to do with several studies that suggest that these implanted devices could cause subcutanous sarcomas — malignant tumors. This isn’t due to the radio frequency, it’s simply due to something foreign being under the skin (the tumors develop around the chip itself. Opponents argue that of the 10 million chipped pets, this isn’t a major issue, but it is something to think about. So now, I’m back to wondering, would I? The chip will only help “mom” out when someone (the police, etc) find her. If she’s stuck out in the woods tangled in briars, it won’t help? I guess in my situation, I wouldn’t have been overly concerned about the cancer, considering her age and the greater risk of her getting lost–but I’d only do it it kept my mom safe and allowed us to find her quickly. I would want her found minutes, not days later. One major microchip company that has recently been in the news is Verichip. The chips about the size of a grain of rice and contains a 16-digit identification number which is scanned at a hospital. Once the number is placed in a database, it can provide crucial medical information. This chip is now being tested in about 25 Alzheimer’s and elder/ill persons in Palm Beach, and Del Ray Beach, Florida. One such system is Roam Alert, and here’s a diagram of how it works in a facility. Each resident must wear a non-removable band. While this may cause skin irritation and some patients obssess about it, it’s a necessary component. I’m not endorsing anything here, I’m just using these companies as examples of what’s out there. Most family caregivers are too busy doing the actual care–driving to the docs, cleaning up, meds, and food prep to have the time or energy to do all this research. I can’t help but believe that this is all a matter of time until we track and chip our loved one’s who cannot make good judgements. We will have to reconcile our sense of moral obligation in regard to privacy issues with our moral obligation to keep them safe. Will there be abuses? I’m sure. Just like all technology, it’s amoral and up to the user to be ethical. We can already track people by their cell phones, and as the numbers of Alzheimer’s patients swell, this will not only become big business, it’ll become a national concern. If not the chip, how do we keep mom and dad (or our husbands and wives, sisters and brothers) safe? I’m just asking because I truly don’t know the answer. If you’re below the age of 65, you may worry about Alzheimer’s, but most likely, you’re not affected yet. 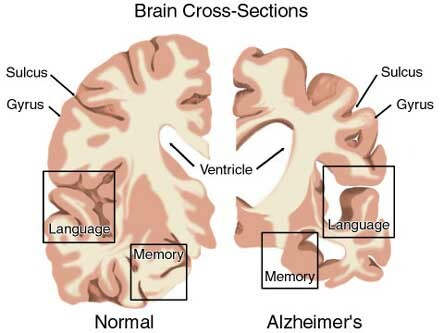 Alzheimer’s is rare at that stage of life, affecting about 1 person in 1000 in the general population, but over the age of 65 it affects about 1 in 20. And the odds increase with age. Women have a slightly greater chance of developing Alzheimer’s than men. Two factors of Alzheimer’s are plaque and tangled neurons. Both cause the brain to “shrink” and not make the proper connections. Memory, judgement, disorientation and logical and rational thinking are affected. Alzheimer’s can occur as early as in your 40s whereas dementia doesn’t usually strike before your 70s and is more of a gradual process. I’d rather go out bungee jumping, hang gliding, or mountain climbing. Remember the movie, Second Hand Lionsand the airplane through the barn? Sounds exhilerating to me. But the fact is, we have very little say-so about whether we get Alzheimer’s or not. There’s very little you can do to avoid Alzheimer’s. There’s been some speculation with aluminum, but that’s still up for debate, and the experts also suggest to avoid getting hit on the head, but then again, they’re neurologists. What else are they going to say? If both parents get Alzheimer’s, well, don’t try to think about that. Bottom line is, we know very little about this baffling disease. Make plans now. Say what it is you want–do that living will and five wishes–don’t be afriad to talk. If you get Alzheimer’s, take your meds and trust that your family will take care of you the best they can. Tell them they’ll have to love and remember for the two of you. Will You Be Caregiving In Your Golden Years? I’m a sandwich generation caregiver. My 89-year old adoptive mother (who suffered with Parkinson’s and Alzheimer’s) moved in with us–my husband and I, two of our three daughters, plus a menagerie of dogs and cats. My situation won’t be the same. We have three daughters, and I had all of them while I was in my twenties. That means when I’m 89, my daughters will be 67, 66, and 63. Yikes. I hope they’ll be in good health and that we can all toodle around and take road trips, eat triple decker double-dipped ice-cream cones and enjoy our grandchildren–and my great grand children. But there are no guarantees we’ll all be in good health. And being in your late sixties and caregiving can’t be a picnic. Just ask all the boomers who are starting down this road now. Ironically, my mother-in-law has a mother-in-law. Neither are spring chickens. My mother-in-law is 79, and her mother-in-law is 95. My mother-in-law has begun to slow down and is dealing with an arthritic knee. Her father-in-law died this year and they’ve been driving three hours a day to help care for his mom (my mother-in-law’s mom-in-law). They’re worried about how things will go in the future, what care she’ll need, how they’ll manage. They face the same questions I faced–what do we do about mom? Do we place her in a care facility? Does she live with family? Are any of us capable of caring for her–long-term? My father-in-law just retired. He was planning on golfing, driving to see all the kids and grandkids, and instead, he’s caregiving. Guess you just can’t get away from it. The best you can do is look a bit ahead and make a semi-plan. And as we age, caregiving is even more difficult–physically in particular. Families have new questions to ask. New plans to make. Grab the moments of fun now and not wait for some “golden” day for that dream trip or to think you’ll sail into your senior years in the glow of a sensual–just-two-love-birds sunset. My plan is to really, really spoil my grandchildren–afterall, they’ll be young enough to care for me. That, and live big/love hard–now. I talk to a lot of caregiving/Alzheimer’s, hospice, and Parkinson’s support groups. I read from my book, MOTHERING MOTHER. We laugh. We cry. We complain. But there’s almost always someone in the back of the room–eyes downcast, their arms just seem to lay there. They don’t “get in the mix.” They’re not animated, angry or teary. They’re not anything at all. And you’re right. I can’t help, and bythat I mean, I can’t fix this. I kind of know how bad it is, but not your bad, only my bad. I don’t know how bleak your situation is. You’re the one my heart goes out to. You’re the one I want to sit with–just sit. I could offer advice, and you don’t even feel like slapping me, so I won’t. I could ask you to ask for–and seek out help. You’ probably know that, but if you don’t–and can’t, then e mail me and I’ll try and find some help–somewhere. But for now, on this page, in that room, I’ll just shut up and sit beside you. Author of MOTHERING MOTHER: A Daughter’s Humorous and Heartbreaking Memoir. Although I wrote Mothering Mother, in truth, I’m a Daddy’s girl. I have a theory: we unconciously sort people into good-guy/bad-guy categories. Heroes and villians populate our worlds. The problem is most people are neither. Daddy was my hero. I was adopted when I was four years old and he was fifty-eight. That’s quite an age span, but I didn’t mind. I didn’t know how old Daddy’s were supposed to be. He was the first man knew that was good and sweet and dependable. Daddy was big–in height, weight, and spirit–and I knew he could protect me. For me and all that had already happened before Iwas adopted, protection was paramount. Daddy was patient with a rambunctious, smart-alec kid. We had watermelon contests in the summer and he taught me how to fish. I played in his rose garden and ate his homemade pear preserves. He taught me how to play baseball and he never got up from his lawn chair to do it. He read the paper each night, and I stood behind his Lazy Boy chair and pin-curled his silver hair while Walter Cronkite dolled out the nightly news. And he never complained. He loved peanut butter, homemade poundcake and anything ab0ut World War II. Daddy died fifteen years before Mother and although he’s been gone 25 years. I tell our stories. And I miss him every day. In many ways, I cared my mother because I knew wanted and needed me to. In a way, I was caring for him. I’ve received lots of call this week urging me to watch the NBC Nightly News special, Trading Places–about caring for our parents. What is so amazing is how much family, friends, and now acquaintances who are familiar with my book, Mothering Mother identify my book with this subject. I feel connected, and I feel that (hopefully) my words are beginning to make a difference. My heart goes out to the thousands and thousands of families who do not have the means to place their loved ones in assisted care. They have to carry the emotional, physical and financial responsibilities–and with little governmental or community supplement. They limp by, exhausted and worried about what will come next, but they do it. They can’t turn their backs on their moms/dads/children/siblings who are aging, disabled or ill. And what’s worse, they dare not speak their deepest fears, much less their ugly truths. After all, they have to keep it all together–for everybody. I’m grateful that NBC has addressed the issue of caring for our parents. The overwhelming response that they’ve received has certainly proven how timely and relevant this subject really is. Mothering Mother will play a role in the American landscape. It will have impact. Why? Because people need it. I know because I needed it. Here’s what I posted on Brian Williams blog regarding the series, Trading Spaces. Caring for our parents is a privilege. I’m not saying it’s not challenging. I know it is, but I also know that the passing on of our elders stories and wisdom is something of great value. Whether you have the ability to care for your parents in your home, or with assistance in their home, or a care facility is an individual decision based on your own personal circumstances of what is best for everyone involved. But the fact that our parents are living longer and that we, their children and/or other loved ones must “step up” and participate in their care has now reached epidemic proportions. Our parents need us, and we need them. My mother lived with my husband and I and our three teenage daughters for the last almost three years of her life. It wasn’t easy physically or financially. My mother thought she had saved enough money, and that she had enough insurance when in reality it wasn’t nearly enough for the staggering costs of elder-care. At times, I felt that I couldn’t give anyone enough–not my husband, not my children or my mother, and there certainly wasn’t any time left for me. I journaled every day. I wrote about how scared I was, how frustrating it was to watch my mother’s health slowly decline, and how I wondered if I could physically stand up to the task. I wrote about what it’s like to mother my mother, what it did to my soul, how I perceived myself, what I had learned about my mother and me and how very fragile and resilient faith really is. It’s become a book, Mothering Mother, April 1 release by Kunati Books. And what I desire more than anything is that by revealing my fears, my inadequacies, my frustrations–and also what I learned about hope and life–and that it will inspire others. We stuck together…because that’s what families do.